One of the major difference between the grounding and the earthing is that in grounding, the current carrying part is connected to the ground whereas in earthing the non-current carrying parts is connected to ground. The other differences between them are explained below in the form of the comparison chart. Definition The current carrying part is connected to ground. The body of the equipment is connected to ground. Location Between the neutral of the equipment and ground Between the equipment body and earth pit which is placed under the earth surface. Protection Protect the power system equipment. Protect the human from electric shock. Provide the return path to the current. It discharges the electrical energy to the earth. Use	 For balancing the unbalance load. For avoiding the electrical shock. Examples Neutral of generator and power transformer is connected to ground. The enclosure of the transformer, generator, motor etc. are connected to the earth. In grounding, the current carrying parts are directly connected to the ground. The grounding provides the return path for the leakage current and hence protect the power system equipment from damage. The grounding has several advantages like it eliminates the surge voltage and also discharge the over voltage to the ground. The grounding provides the great safety to the equipment and improves the service reliability. The ‘earthing’ means the connection of non-current carrying part of the equipment to the earth. When the fault occurs in the system, then the potential of the non-current part of the equipment raises, and when any human or stray animal touch the body of the equipment, then they may get shocked. The earthing discharges the leakage current to the earth and hence avoid the personnel from the electric shock. It also protects the equipment from lightning strokes and provides the discharge path for the surge arrester, gap and other devices. The earthing is achieved by connecting the parts of the installation to the earth by using the earth conductor or earth electrode in intimate contact with the soil placed with some distance below the ground level. The earthing is defined as the connection of the non-current carrying part like the body of the equipment or enclosure to earth. 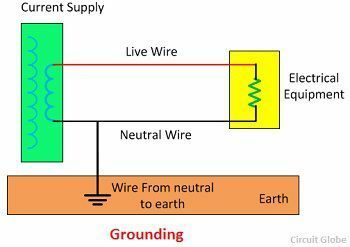 In grounding the current carrying part like neutral of the transformer is directly connected to the ground. For grounding, the black colour wire is used, and for earthing the green colour, the wire is used. The grounding balanced the unbalanced load whereas the earthing protect the equipment and human from an electrical shock. 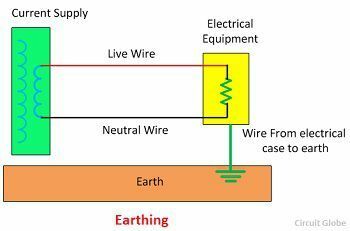 The grounding wire is placed between the neutral of the equipment and the earth whereas in earthing the earth electrode is placed between the equipment body and the earth pit which is placed under the ground. In grounding the equipment is not physically connected to the ground, and the current is not zero on the ground, whereas in earthing the system is physically connected to the ground and it is at zero potential. The grounding gives the path to an unwanted current and hence protects the electrical equipment from damage, whereas the earthing decrease the high potential of electrical equipment which is caused by a fault and thus protects the human body from the electrical shock. The grounding is classified into three types. They are the solid grounding, resistance grounding and reactance grounding. Earthing can be done in five ways.The different methods of earthing are the pipe earthing, plate earthing, rod earthing, earthing through tap and strip earthing. The earthing electrode should not be placed near the building whose installation system is earthed more than 1.5 m away. The resistance of the earth wire should not be more than 1 ohm. The wire use for electrode and circuit should be made up of the same material. The electrodes should be placed in vertical position so that it can touch the layers of the earth. The size of the conductor should not be less than 2.6 mm2 or half of the wire used for electrical wiring. Bare copper wire is used for earthing and grounding. Green 6 THHN (Thermoplastic high heat neutral coating wire) and gauged copper wire of different sizes like 2,4,6,8 etc. are also used for earthing and grounding. Amazing. Simply written. Referred various sources but this clearly explains.